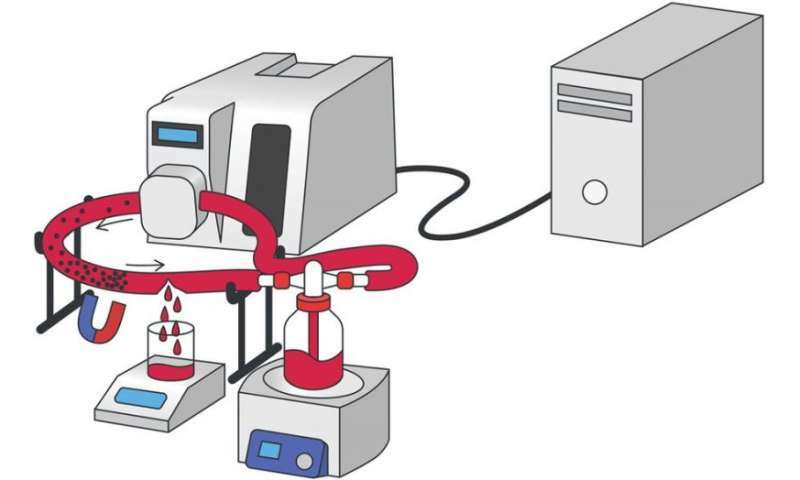 A system simulating the conditions of a damaged blood vessel. Credit: E. M. Shabanova, Andrey S. Drozdov et al. Scientists from ITMO University have found a way to effectively stop internal bleeding via magnetically driven nanoparticles containing thrombin. A drug based on these nanoparticles can be injected intravenously and delivered straight to the site of a vascular injury. It can accelerate local clot formation and reduce overall blood loss by 15 times. The nanoparticles are not toxic to humans and can potentially be used for safe treatment. The results were published in Scientific Reports. Internal bleeding is a serious medical emergency. It may be caused by numerous medical conditions such as traumas or chronic diseases and it occurs in various body parts including the brain or the stomach. Yet the prognosis for majority of cases is quite pessimistic, as internal bleeding usually causes hematomas, organ dysfunction and massive blood loss. For example, gastrointestinal bleeding was recently estimated to account for up to 20,000 deaths in the United States only. The only possible way to avoid these hazards is to provide a proper and quick medical treatment. Although there are several drugs that can stop severe blood loss, none of them can help entirely without surgical intervention. In an attempt to stop bleeding more effectively, scientists are developing drugs that can be applied using a simple injection. The main issue with such drugs is that the remedy has to initiate clot formation only at the site of vessel damage instead of affecting the entire vascular system. "We tested the nanoparticles' efficiency on human blood plasma samples and a special vessel model," says Andrey Drozdov, member of SCAMT Laboratory at ITMO University. "After the first experiments with plasma, we found out that thrombin in our nanoparticles is less active compared to its free variant. Yet we went on with the tests and ran additional experiments on a model of the blood stream. We were able to observe how nanoparticles behave when the vessel is damaged. It turned out that magnetic localization compensates for lower activity. Nanoparticles reduce the clotting time by 6.5 times and can reduce total blood loss by 15 times." "Synthesizing these nanoparticles is not easy," says head of the laboratory Vladimir Vinogradov. "It is important to keep their size down to 200 nanometers; otherwise they will not be suitable for injection. In addition, mild synthesis conditions are required so that the thrombin molecule does not break down and lose its activity completely. Finally, we could only use biocompatible components. We checked the toxicity of our particles with human cells and made sure they are completely safe even during prolonged exposure." This work is part of a larger project aiming to create hybrid nanomaterial-based hemostatic drugs. Scientists are currently planning to test the drug based on the obtained material on animal models and, in case of success, run clinical trials. Researchers hope to create a nanoparticle-based hemostasis system that will be able to quickly and efficiently stop internal bleeding.